Below is a list of supplies referenced during a seminar at the Woodsmith Store on October 17. I remember as a young boy my dad taking me to the small-town barber shop in Delaware, Ohio. I remember sitting there, waiting my turn, reading comic books, and listening to the old men gossip and tell stories. I couldn’t wait until it was my turn in the chair because I knew I’d get a piece of Bazooka bubble gum afterward. The barber kept a big box of it under his cash register. I also remember the barber giving some of the men shaves. This was back before health regulations put a nick in that practice. I remember the barber pulling out his straight razor and sharpening it on his leather strop hanging on the barber chair. I seem to remember the strop being two-sided — leather on one side and linen on the other. If memory serves me correctly, the barber would make a few strokes on the linen side before finishing on the smooth leather side. For years, I used some scrap pieces of suede leather as a strop after sharpening chisels and plane irons. Don’t ask me why. I think in my mind I was removing the microscopic remains of the wire burr left after using the “scary sharp” method of sharpening using wet/dry sandpaper. But I still did it after I switched to a combination waterstone. In both cases, I convinced myself that it put that final sharp edge on the tool. I could shave with them. When I acquired some larger pieces of thick leather, I decided to make strops out of it. There was enough material to make two strops about 2-1/4″ wide by 7 or 8 inches long. I cut two pieces of 1/2″ Baltic birch to use as a base for my strops. I cut the leather slightly wider than the base and glued the rough side to the plywood. I clamped them face to face to keep the leather flat. Good old Titebond was all I used. 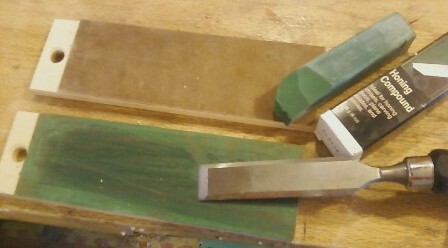 I charged one of the strops with the green honing compound from Veritas. The other, I’m going to leave clean. The theory is that the charged one will be a bit more aggressive at removing the wire burr while the final polish will come from the clean strop. Now, I’ve been reading a lot about stropping. Should you use the rough side or smooth side of the leather? Thick or thin leather? Charged or clean? 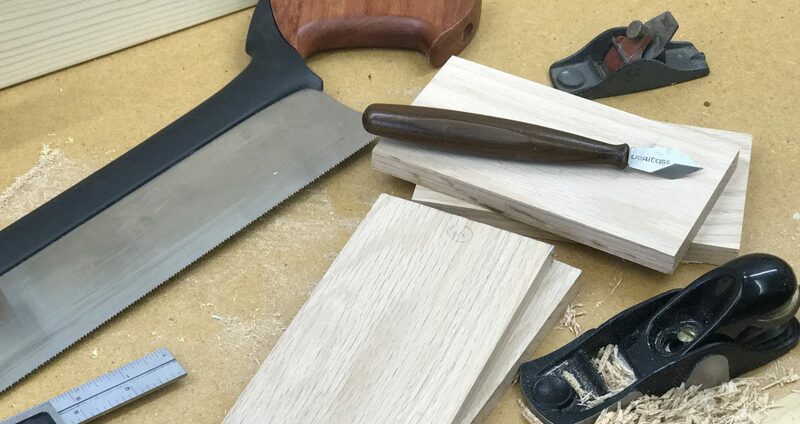 Should you strop straight tools like chisels and plane irons or will stropping round over the bevel? Having dabbled in carving, stropping is about the best and only way to periodically hone your tools as you carve. For gouges, the leather “gives” to conform to the shape of the tool. There are a lot of good articles on the ‘net about honing. Joel over at Tools for Working Wood has written several. And Ron Hock has a few things to say about sharpening on his blog. As a part of rehabbing my newly-acquired but used Lie-Nielsen scraper plane, I needed to sharpen the blade. If you’re not familiar with how a scraper plane works, it’s quite a bit different than a standard bench plane like a smoothing plane. If you’ve ever used and sharpened a card scraper, you’re familiar with how they work. A slight burr is formed on the edge. It’s the burr that performs the cutting action. I installed the blade in the plane. I just let it drop to the surface of the workpiece the plane was sitting on. By adjusting the angle of the blade, the burr will eventually “bite” into the workpiece and form thin shavings. This is a great tool to use for smoothing large worksurfaces that might have unpredictable grain prone to tearout with a standard smoothing plane. The scraper plane doesn’t care about the direction of the grain. It will create a glass-smooth surface.